It was so good. I loved the book and also I loved the bit when he was always was late for school even though it was four minutes to get there. Tom and me just love to doodle and these books are just totally amazing! The way it is written is really great too. This book is a wonderful book.I think of this book funny because it has great jokes.Also,I love the doodling that the author did.I think the moral of this book is to always stay calm.This book was a fiction but,it had some facts.I love the character Tom Gates because of his cool logo's for his band.I like how at the end of each book it teaches U how to make something.I would recommend this book to 7-10 year old because of the funny use of language.Thanks for the pictures! tom gates always gets in trouble with his teacher because he always forgets his homework when he has to bring it in to school and is always late because he always has a ten minute chat with his best mate dereck fingle and dereck is his lives nextdoor to him. It was very good. 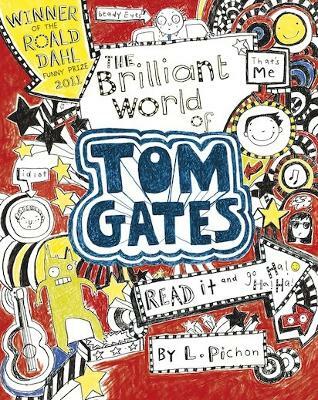 Tom Gates was scared at the start because he was sitting in the front of the classroom. It is a brilliant book . tom gates tells you about his life. He has a fried caled Derek and a girl caled Amy Potter (who he likes ). My favourite character is Tom Gates. He is a little naughty and sneaky which makes me laugh. I love that there are lots of drawings in the book. I like the stories about school, his teachers, his friends and his sister. I love Tom Gates because its very funny and the pictures are great. this is a great fiction book, i think everyone should read Liz Pichon's books.